We have upgraded and redecorated the cottage while retaining its 1950's charm. It has a woodburner for winter stays and we never run out of firewood. All the beds have electric blankets. The master bedroom has an ensuite toilet. You will love the peace and quiet and the views across rolling farmland. We do our best to meet your needs and ensure you have a pleasant and comfortable stay. Please note that cellphone reception is poor in our area. Please ask if you need to use our landline or WiFi for urgent communications. We live on a property that has been in our family for 106 years, and we love to share its unique character with our guests. We especially enjoy hosting family groups as well as people who are visiting Feilding to attend special events. Modern facilities, including fridge-freezer and front-loader washing machine. 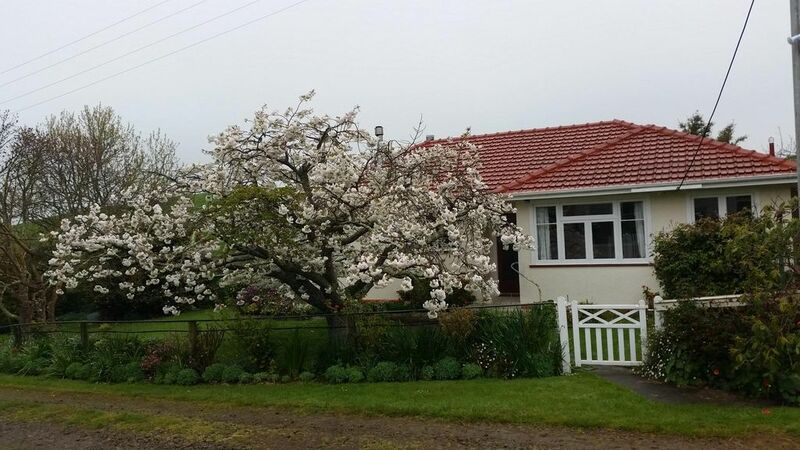 Situated on our family farm [n a quiet rural area, Wharerata is surrounded by established gardens with views of rolling countryside and plentiful birdlife. Thanks Anna, your place was perfect for us and our small team, thank you for giving us access to the WiFi, it was much appreciated. A country cottage with some history. Farm interesting been in the family for many years. Nice location only 10 min from town easy to find and tidy. It was the peaceful retreat I was looking for. Hosts were welcoming but not intrusive. I'd love to come and stay again. very much enjoyed our stay at the farm cottage. Out in the country, very peaceful yet only about 10 mins or less drive to Feilding. Lovely garden. Cottage was clean, tidy and very comfortable. My son and I stayed here for several weeks, and we can't say enough wonderful things about Anna and Malcolm! The home is nestled in a beautiful location, birds waking us up in the morning and cows checking in on us throughout the day. The garden outside is gorgeous, and well taken care of. The home itself is wonderful, we had everything we needed to cook and make ourselves comfortable, and Anna and Malcolm made sure we were well supplied throughout our stay. My son loved the toys that were provided as well! If you want to experience the country, this is definitely the place. We were lucky enough to get a tour of the farm during our stay, and my son keeps on talking about it. Without a doubt, this is quite the gem. Thank you Anna and Malcolm! Feilding is a quiet, attractively laid out rural service town with most amenities close to the town centre. It has an excellent aquatic centre, library and museum. Manfeild Park motor-racing circuit is a high quality facility on the edge of the town.